The RMS Titanic sank to the bottom of the ocean after striking an iceberg, and over 1500 people died the night of April 15, 1912. However, while these are all facts that cannot be disputed, there is a documentary that claims that the RMS Titanic was doomed from the moment of her construction. There have always been a lot of questions as to how the biggest ship in the world sank so fast, but was it really just the iceberg that caused the ship to sink? A forensic metallurgist named Jennifer Hooper-McCarty believes that other factors were involved in the Titanic‘s sinking than the events that have been recorded. The documentary also has a reenactment of the Titanic Inquiry and shows things like Bruce Ismay testifying, and within that testimony are more reenactments of important conversations, like when Ismay spoke to Alexander Carlisle over the number of lifeboats that the ship should have. The reenactments are interesting because it makes the testimony given for the Titanic Inquiry more than words on a page and brings that testimony to life. There is a lot of background given about things like how the Olympic was back at Harland and Wolff for repairs, and because the ship was not sailing, officers from her were transported to the Titanic. Smith then had to rearrange things with his crew, and Second Officer Blair was asked to leave the ship. While he was packing, he took the key to the locker where the lookouts’ binoculars were kept, which is going to play an important role later with the lookouts. A large iceberg was seen breaking off the coast of Iceland and drifting with the Labrador current, which was going to take it right into the path that commercial ships take between Europe and America, but icebergs have never been a problem because of the wireless communication system that ships carried. Between April 10th and April 14th, Titanic received six ice warnings, but just because a ship got a warning did not necessarily mean that the captain or other officers on duty on the bridge would get to see that message. On the night Titanic sank, the wireless operators were busy because of the limited window they had to communicate with Cape Race, Newfoundland. In the documentary, the reenactment of the Titanic Inquiry testimony of various officers is shown including Lightoller and Fleet, the lookout that saw the iceberg and alerted the bridge. During his testimony, Fleet states that binoculars would have made a difference in how quickly they would have been able to spot the iceberg. Jennifer Hooper-McCarty points out that when the ship struck the iceberg, the blow was so slight that some people called it a “glancing blow” or a “shudder” that they barely felt. She points to the testimony of Frederick Barrett, a fireman that was in boiler room number 6. Barrett was present the moment that Titanic hit the iceberg, and how he was hit with a burst of water so hard that it nearly knocked him down. Was the iceberg really hit that hard that the hull plates broke or was it a problem with the metal that caused the hull plates to pop open and let the water come rushing in? This is only a question that a forensic metallurgist can answer. Jennifer Hooper-McCarty earns her living studying metal, and it is her belief that the rivets were made from an inferior metal, which made them weak and unreliable. 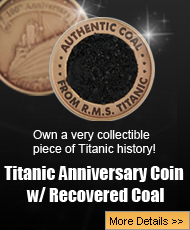 She conducted tests on 47 rivets that were brought up from the bottom of the ocean at the Titanic wrecksite. According to her tests, the rivets were not steel but made from wrought iron. To prove her theory, hull plates, much like the kind that were used on the Titanic, were put under a series of tests to measure their strength. 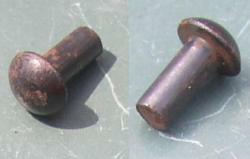 The rivets failed, and a closer examination of a small slice of rivet revealed impurities in it, which means that slag in the metal made them weak. When the Titanic scraped the iceberg, the rivet heads failed, which allowed the plates to open up and for water to come into the ship. When going through the paperwork from the White Star Line and from Harland and Wolff, Hooper-McCarty found the original order for the rivets, and the grade of steel was what she was more interested in finding. What Hooper-McCarty found out is that the rivets were a number 3 grade, which is considered to be of low quality. The grade 3 means that the iron used had a higher sodium content and has more impurities, and without pure metal in the rivets, they were not strong enough to hold the hull plates together should a collision happen. According to forensic metallurgist Jennifer Hooper-McCarty, the Titanic disaster was the result of inferior rivets with poor- quality metal that failed at the worst possible moment and caused 1500 people to die in the North Atlantic. 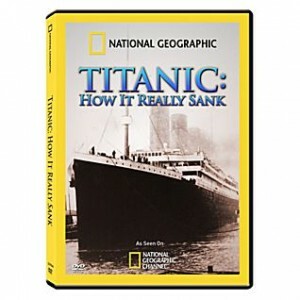 The Titanic: How It Really Sank documentary answers questions that people interested in the sinking have always asked, and that question is, what made the world’s biggest ship sink in a little over two hours? A forensic metallurgist named Jennifer Hooper-McCarty claims that tests on the rivets that were used to hold Titanic’s hull plates together were of poor quality, and failed to hold the plates together during the night of the collision with the iceberg. The management of the White Star Line, most like Bruce Ismay, were the ones that ordered the rivets, and they ordered a lower quality of metal for the rivets, and the decision to save money might have made the difference between a collision that was deadly or one that would have kept Titanic afloat.